Begins on Friday May 25, at 7:00 AM & ends on Monday May 28 at 1:00 PM at our beautiful Home near Danielsville, Ga.
We will have dance band music on Friday evening as well as music on Saturday evening for all to enjoy. So come and join in the entertainment. If you play any instrument be sure to bring it for some pick'n and grinn'n, as there is always time for that. We will have a little card playing, a few bull sessions and plenty of background music by our DJ, Jimmy Grant while you enjoy talking over old and current times. We’ll have a well-stocked PX open for purchase of military items. Fee hasn’t changed, $ 40.00 per Adult and children under 12 are free but must be with an adult. Dues for 2018 are still $20.00 and must be paid at registration if not previously paid. We provide two (2) meals a day, breakfast (not brunch) from 7 am till 9 am and the evening meal each day served from 5 pm till 7pm. Outside concessions will be cooking hot dogs and burgers for lunch purchase from 11:00 AM until 1:00 PM. We are planning to have a flag retirement ceremony on Saturday afternoon and then our traditional candle light service accompanied by bagpipes to honor and remember our sisters and brothers who are no longer with us. The members have made a lot of improvements to the buildings and grounds. We have a new mahogany bar in the rec area and a new roof on that building as well. Tickets will be sold up to Saturday evening and the winner will be drawn then. See any member for your tickets; they are $ 5.00 each Please help us out, as we need funds to maintain the grounds and buildings. Twenty-three years of hard work and dedication has made this campground and area possible. Come and enjoy the fruits of this labor and the friendship of your veteran buddies. Monthly meeting still held on the last SATURDAY of each month except JULY and DECEMBER at 11:00AM. PLEASE come and break bread with us and be a part of this great organization. We need each one of you to keep the lifeblood alive. 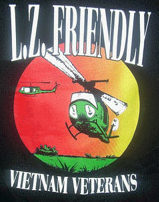 There have been recent discussion and meetings of the board concerning the disposition of the L.Z, Friendly holdings. Of great concern is the dwindling number of members, lack of new members and member support of the organization in maintaining the grounds and structures. Old soldiers do die and that is of great concern. All members should try to attend these meetings. The advice and suggestions of each member is needed so a possible solution can be made to avoid the demise of our lands. Or all the effort in the past will not be lost.